Richard Montana (Madsen) is a California detective who always gets himself into big trouble when he goes deep into dangerous situations. When he gets mixed up with Mario Gio (Lynch), an extremely wealthy drug trafficker, and his lady Lisa (Vela), he gets way more trouble than he bargained for. Gio wants Montana to use his police authority to arrest all his competitors. Montana and Lisa begin hatching a plan of their own. Montana’s partner Nealy (Peck) doesn’t like any of this one bit, and Montana’s rival on the force, Henderson (Richmond) has his suspicions. With no one to trust, what will Montana do? Michael Madsen really turns on the charm this time as the cooler-than-cool Montana. He always has some snappy quips at the ready. His whole look is reminiscent of Billy Joel, and his attitude is beyond laid back. He might be the coolest man ever. Even when he’s a cop on the edge, he’s still cool. He still has to face up to his classic yelling Captain, Reeves (D. Paul Thomas), but he does it with, well...coolness. Madsen’s acting style is oddly naturalistic and he doesn’t even seem like he’s acting. Maybe that’s why he has fans and they seek out his movies, as we do. Rosie Vela as the singer in Gio’s club (she actually sang backup for ELO for a time), and female lead will remind you of Kim Basinger. It’s great to see Branscombe Richmond on board, especially as a friend/enemy of Michael Madsen. Let’s not forget David Fralick as one of Gio’s goons - he was in fellow Madsen vehicle Executive Target (1997) as well as crud like Deadly Reckoning (1998). Inside Edge has good music and was going for some Film Noir-ish elements, and for the 90’s, we can compare it to Genuine Risk (1990). 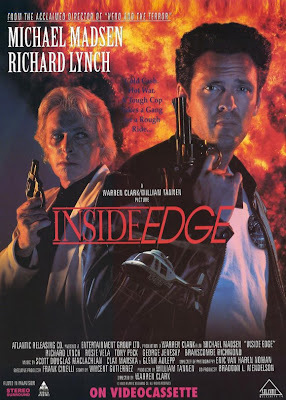 Interestingly, even though this film has Madsen, Lynch, and Richmond, among others, and got a U.S. (and international) release, it seems Inside Edge is not widely seen. Even fans of the above names don’t really know about this movie. Maybe that can change. And while the pace of the movie is a bit slow, especially before the climax, at least it’s only 80 minutes (despite what some sources say). For an under-the-radar DTV “neo-noir”, Inside Edge really fits the bill. I love the 90s action films but I haven't watched this one. I do like Michael Madsen as actor. This one is pretty good. Another solid Madsen action flick is Executive Target. Very enjoyable. Good review. Madsen basically oozes cool. It's always interesting to see Madsen play a good guy since he plays villains so often, he was also pretty good in "Man With A Gun"
M. Brown: Madsen's cool attitude is what always draws us to his movies. Venom: We agree, we like seeing him as a good guy. Man With A Gun was pretty decent.